The last time you were in a gym, do you recall seeing people doing exercises with cylindrical objects made of foam? This may seem a little unorthodox on first viewing, but it is a common sight – and with good reason. This type of exercise is known as foam rolling and it is a concept that has caught on with fitness fanatics everywhere. It is a soft tissue therapy for your muscles which involves working the muscles by massaging them repeatedly with a roller made of foam. Foam rolling provides an intense workout with a very simple piece of equipment; indeed, you don’t even need to sign up for gym membership to try it. 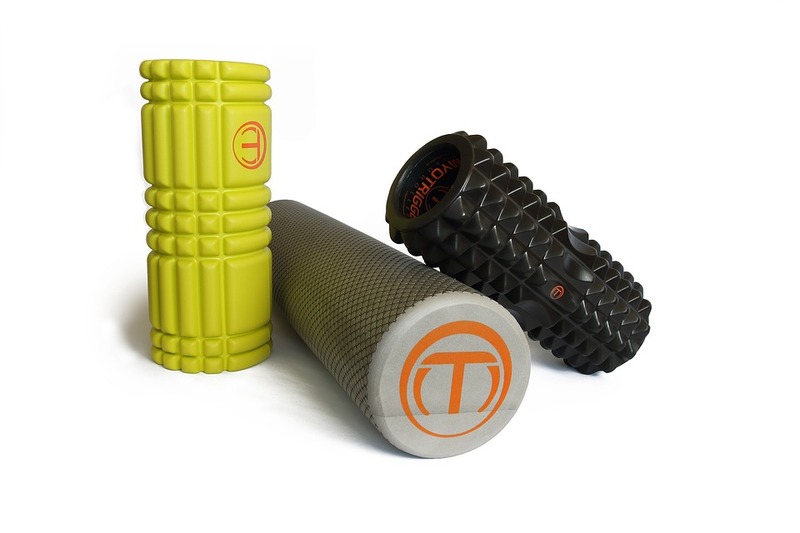 You can simply buy a foam roller online and begin using it at home from the moment it arrives. All you need to do is place the foam roller on the ground and roll over it with the muscle area on which you want to focus. It will be quite intense to begin with but if you exercise sensibly and stick with it, it can produce astonishing results in the space of a month. Anyone who engages in foam rolling exercises chooses their equipment and routines very carefully, as what works for one person might not be suitable for another. Here is a quick, practical guide to using foam rollers. Foam rollers come in different types and sizes, depending on the firmness you are seeking and the part of the body where you intend to use it. They are also colour coded to help you select the right one for your needs. Softer foam rollers will provide a gentle massage, while harder rollers are intended for routines with greater intensity. White: These foam rollers are usually the softest, making them ideal for beginners as they provide a gentle, soothing massage. As they have a soft density, they place very little pressure on the muscles and they allow for plenty of movement between the muscles, bones and foam roller. They are flimsier than high-density rollers, but they still achieve great durability given their relative softness. Blue/Green/Yellow: Foam rollers in colours such as blue, green or yellow indicate a medium density which strike the perfect balance between a gentle massage and a productive exercise. They have enough of a density to produce a deep massage while also allowing for a soft cushion. Blue or yellow-coloured foam rollers are regularly used in Pilates classes. Black: These foam rollers have the highest density and can be quite hard on the muscles, so they should only be used by people who seek a high-pressure massage and who have been using foam rollers for some time. 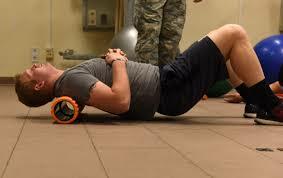 They are usually sought by competitive athletes who want a firm roller to penetrate muscles that are tight and tense. The high density of black foam rollers means that they boast exceptional longevity, even with consistent usage. Lay face down with your elbows on the floor and the foam roller underneath your thighs. Roll slowly back and forth from just above your knees to just below your hips. Rotate your legs externally to exercise the inside quad muscles and internally for the outside quad muscles. Repeat the back and forth movements until all the tenderness has disappeared. Sit on the middle of the foam roller, crossing your right ankle over your left knee. Place one hand, or both hands, on the floor behind you to support your upper body. Shift your weight slightly to the right to apply pressure to your right glute and then roll back and forth slowly to relieve the tension. After a few rolls, swap legs and repeat this exercise for the left glute. Sit on the floor and place the roller underneath your calves. Push down on the floor with your hands and lift your hips to apply pressure on the roller. Roll back and forth from just above your ankles to just below your knees. Walk back and forth with your hands behind the roller as you do this. For increased intensity, cross your left leg over your right as you roll back and forth, swapping legs after a few rolls. Lay on your side with the bottom of your right leg placed on the foam roller between your hip and your knee. Cross your left leg over your right, placing your left foot firmly on the floor. With as much weight as possible on the bottom of your right leg, roll back and forth from your hip to just above your knee. After a few rolls, repeat this exercise with the legs swapped. Lay with the foam roller in the middle of your back across your shoulder blades. Clasp your hands on the back of your head for support, but do not grab your neck. Shift slightly to your right and lift your hips off the ground to place weight on your upper right back. Roll back and forth from your shoulder blades to the bottom of your rib cage. After a few rolls, swap to your left side and repeat this exercise. It is extremely important that you do not roll directly on your spine. This video shows how foam rollers work and explains how they can provide an effective workout. It eliminates muscle aches and pains. It loosens muscles to give you more energy throughout the day. It corrects imbalances in your muscles. It helps you to get a better night’s sleep. It increases your mobility and flexibility. It reduces the likelihood of incurring an injury during workouts. It can boost your immune system. Roll each muscle group slowly for 1-2 minutes. Hold on tight spots for 30-40 seconds to relieve tension. Keep breathing throughout the exercise, as holding your breath won’t allow your muscles to relax. Relax the muscles as much as you can. If you tense the muscles on which you are working, you won’t feel the trigger points you need to release. Drink plenty of water in the 24 hours after foam rolling. If an area is too painful to apply direct pressure, move the roller to apply pressure on the surrounding area, slowly loosening the entire area. Don’t begin foam rolling if your muscles are sore from the previous day’s workout. Don’t roll your lower back and don’t roll onto your spine when rolling your upper back. Don’t roll at a very fast pace, as this will not give your muscles a chance to relax and loosen. Don’t roll directly on an area that feels painful. Don’t spend any more than 2 minutes on a single area. Going over this could cause you to hit a nerve or damage tissue.